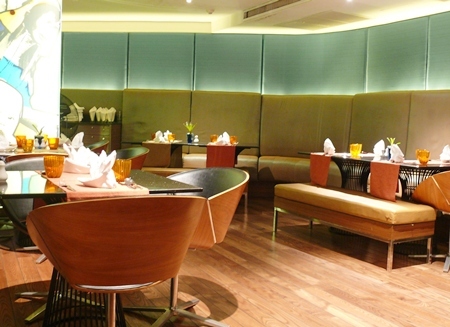 The dusitD2 baraquda pattaya is having a promotion of Vietnamese cuisine from October 1 – 31 at their award-wining s.e.a. restaurant. (This is being done in collaboration with Qatar Airways which flies directly from Bangkok to Hanoi.) It was then with great expectations that the Dining Out Team arrived at the dusitD2 baraquda. I am sure that everyone by now must know of the D2, but for newbies, it is on the right hand side of Second Road, just before The Avenue shopping center and opposite Soi Post Office. At this point I should also correct some misunderstandings regarding their s.e.a. restaurant. 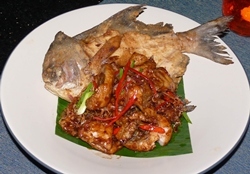 It does not refer to “seafood”, but is an acronym for South East Asian, describing the cuisine. 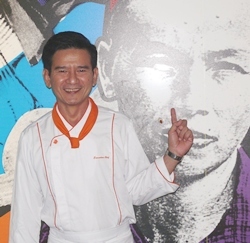 For this Vietnamese promotion (called Hi Hanoi), with the D2 being part of the Dusit Thani group, chefs from the Dusit Thani’s renowned Vietnamese restaurant “Thien Duong” teamed up with dusitD2 baraquda Pattaya’s executive chef Chettha Waiseubkaow to select and prepare the promotional Vietnamese items (in addition to those on the ‘normal’ menu). The s.e.a. restaurant is on the ground floor of the D2 and with one wall all glass overlooking the freeform pool, it has an ‘airy’ ambience. There are also some very large murals produced by renowned designer Sombatsara Teerasaroch, depicting the countries of the South East Asian region. We dined with Michael Ganster, the GM, a man with an infectious enthusiasm for his job and we were quite happy to allow him, and executive chef Chettha, choose some different items for us to experience. Michael also suggested we try the Dusit’s own Chardonnay bottled for them by Domain St. George in California. It was a very pleasant wine and at B. 1,500 is good drinking. One of the first taste experiences was a deep-fried spring roll with an interesting horseradish and carrot side dish, however, the Vietnamese fresh spring rolls which followed were, in my opinion, even better. A new dish for my palate was the brochette of cured pork in Good King Henry leaves. Wonderful presentation, and it came with peeled garlic cloves on the side. A nibble of garlic and a mouthful of pork was sensational. Our next treat was a warm crispy duck with coffee sauce. This was one of the dishes of the evening at our table, and comes highly recommended. But it didn’t end there. Chef Chettha was determined we should experience more, with another very interesting dish arriving at the table being turmeric flavored crispy crepes filled with minced pork, shrimp, chives and bean sprouts. Almost a Vietnamese take on a Mexican taco. Eat it with the fingers, as you would with a taco. The different taste buds were next presented with a deep-fried pomfret fish fillet with a lemongrass sauce and a fried soft-shell crab with salted egg. Both of these dishes provided different flavors, and even the salted egg did not overpower the crab, although it was apparent that the salty flavor was from the egg. The evening was remarkable with the experiences from a different cuisine. 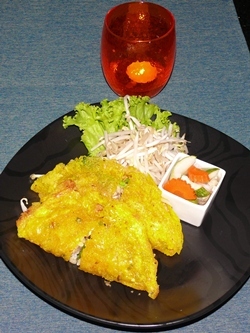 Vietnamese food is neither Chinese nor Thai, nor Laos nor Cambodian, though there are some similarities, with all five countries loosely grouped as South East Asia. Definitely worth the trip into town to try the Vietnamese aspect. In addition to the Hi Hanoi promotion, a Vietnamese wine dinner will be held on Saturday, October 29 at the hotel’s poolside dining venue. Dinner is priced at B 1,200 net per person inclusive of a five-course Vietnamese menu with wine, live entertainment and lucky draw. Advance reservations are highly recommended. As an extra bonus, if you would like to experience Vietnamese cuisine in its home country, then you should also keep your fingers crossed. This promotion includes the opportunity to win a pair of free roundtrip air tickets Bangkok-Hanoi-Bangkok on Qatar Airways. dusitD2 baraquda pattaya, 485/1 M 10 Pattaya 2nd Road, tel 038 769 999, fax 038 769 900, email www.dusit .com/d2pa, www.dusit.com. Restaurant open 6 a.m. (breakfast) until 11 p.m. Secure parking in hotel complex.